We have five workshops in my private studio for 2018 and we love welcoming you to our home, land and studio! If you want to have an art workshop experience I hope you will consider coming to my studio and enjoy how we like to love on others through the details! ONE. Like abstract work and landscapes? Last minute openings for this sold out workshop. 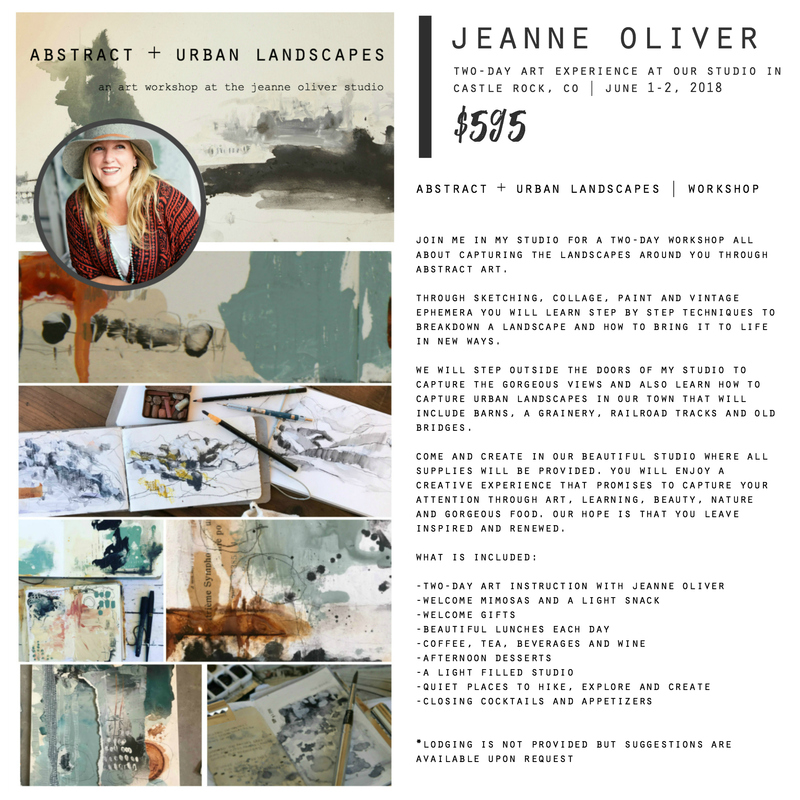 Join me for Abstract + Urban Landscapes. Two days of abstract fun with direction and purpose. Abstract art is not random at all. I will help you break down a landscape and help you so see the shapes to create gorgeous abstract art. It doesn’t hurt that we live on gorgeous land with incredible views. Come and read more. TWO. Want to learn to tell YOUR story through art? 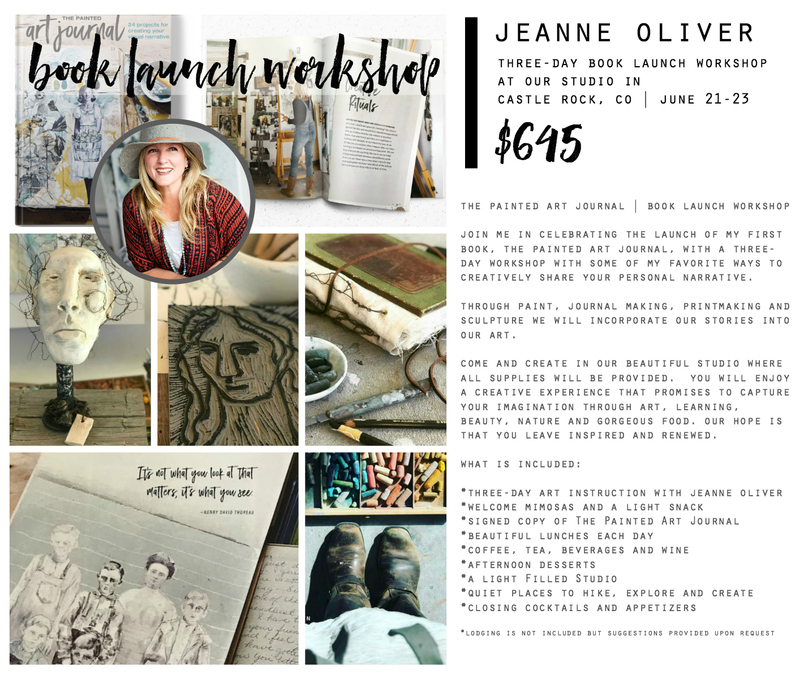 Join me for The Painted Art Journal Book Launch Workshop. In this special three day workshop, we will celebrate the release of my new book with some really fun projects that will put a twist on the book. We will create a plaster, fabric and wire journal, we will spend time unfolding our stories, symbolism and mark making. We will then take that inspiration into carving a linocut full of our story and secret messages. We will end by creating a sculpture based on our whole journey together. Unlike any workshop I have ever offered. Come and read more. THREE. ONE spot just opened up for this sold out workshop. 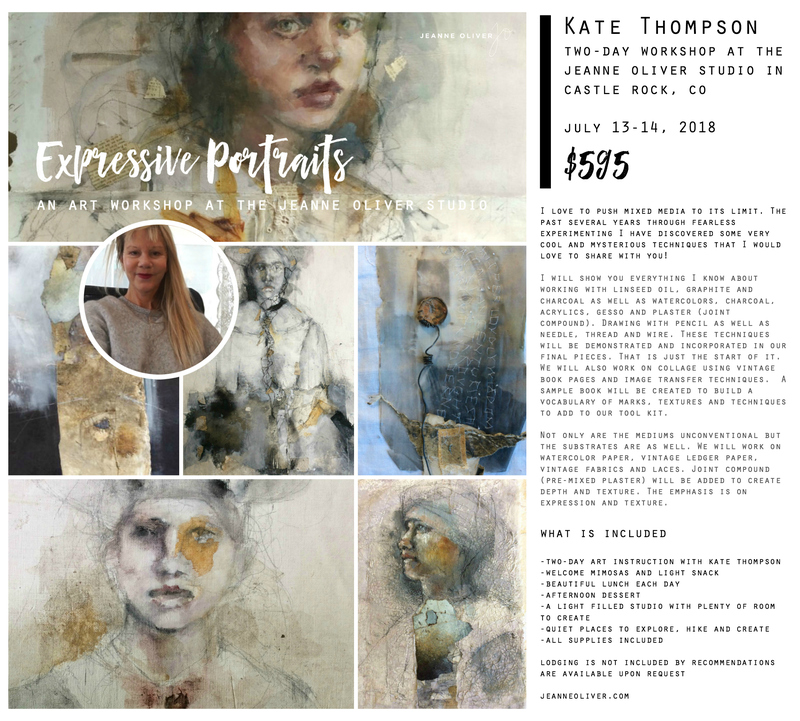 Come and learn with Kate Thompson and explore Expressive Portraits! 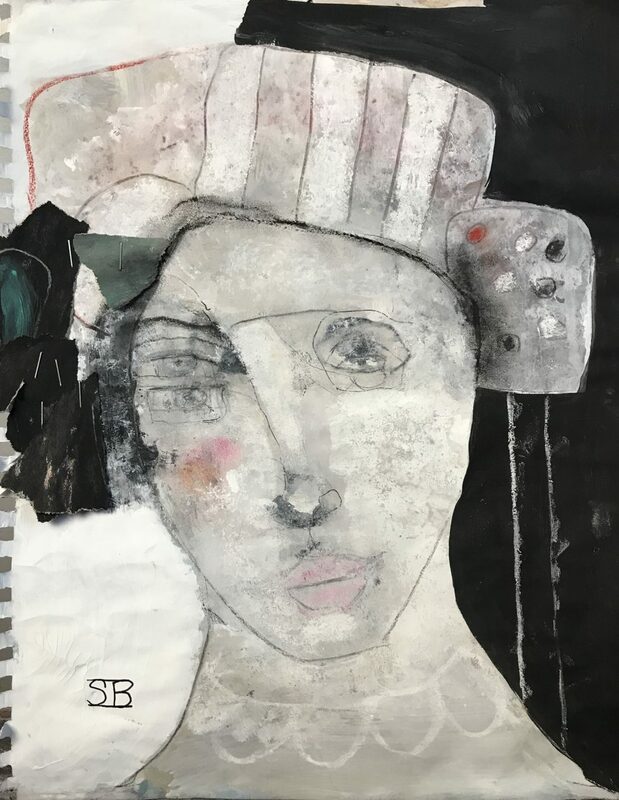 She will show you everything she knows about working with linseed oil, graphite, and charcoal as well as watercolors, charcoal, acrylics, gesso and plaster (joint compound). Drawing with a pencil as well as a needle, thread, and wire. These techniques will be demonstrated and incorporated into your final pieces. That is just the start of it. We will also work on collage using vintage book pages and image transfer techniques. A sample book will be created to build a vocabulary of marks, textures, and techniques to add to our toolkit. Come and read more. FOUR. 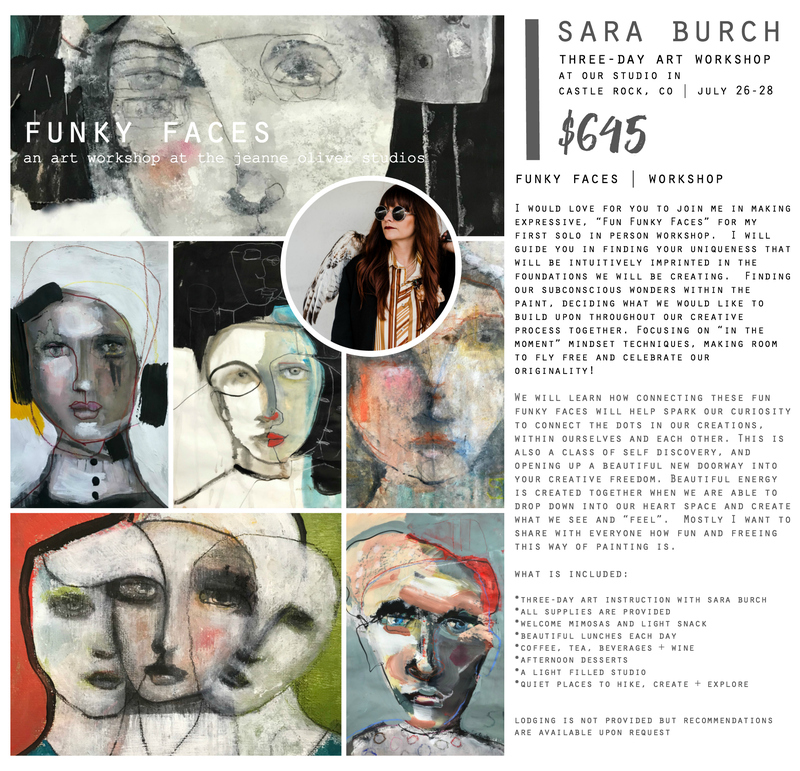 Come and join Sara Burch for her first live workshop Funky Faces! Join Sara in making expressive, “Fun Funky Faces” for her first solo in person workshop. She will guide you in finding your uniqueness that will be intuitively imprinted in the foundations we will be creating.Finding our subconscious wonders within the paint, deciding what we would like to build upon throughout our creative process together. Focusing on “in the moment” mindset techniques, making room to fly free and celebrate our originality! We will learn how connecting these fun funky faces will help spark our curiosity to connect the dots in our creations, within ourselves and each other. This is also a class of self-discovery, and opening up a beautiful new doorway into your creative freedom room. Beautiful energy is created together when we are able to drop down into our heart space and create what we see and “feel”. Mostly Sara wants to share with everyone how fun and freeing this way of painting is. Come and read more. FIVE. Do you love portraits or want to finally figure them out? 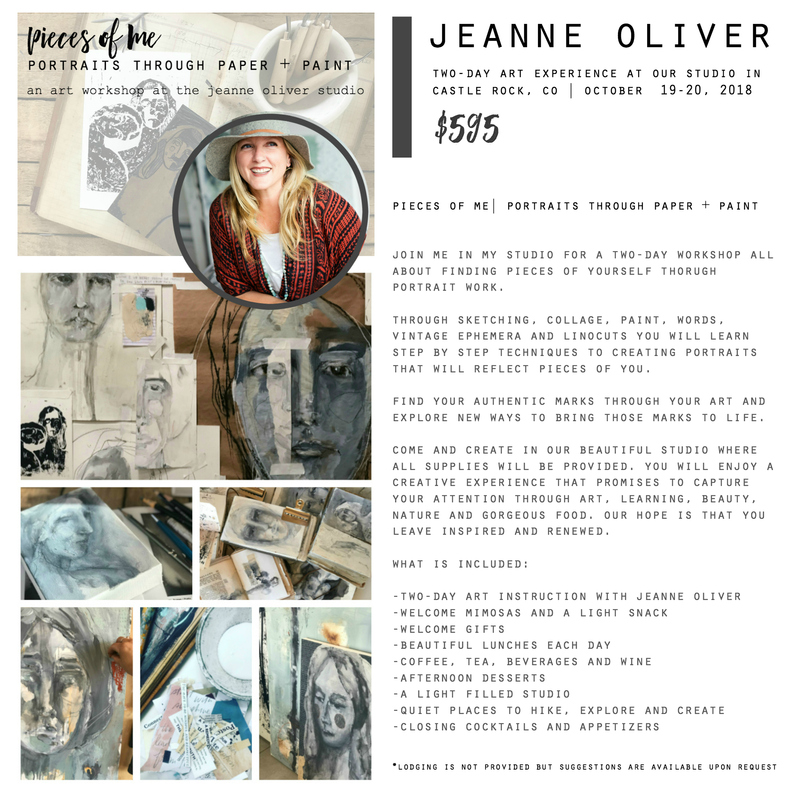 Join me in my last workshop of the year with a two-day dive into portraits using sketches, collage, paint, linocuts, vintage ephemera and more. Pieces of Me workshop is just FUN! The techniques and mediums we will use will get you out of your comfort zone but you will be surrounded by work that you didn’t think you could do. Come and read more. Let me know if you have any questions about any of the workshops. Welcome to our home, land, and studio! I promise you it will be an art experience that you won’t forget. From the moment you arrive, you feel how different a workshop in our studio is! We take care of all of the details and you get to dive into art, connect with other creatives and give your heart and head time to rest and hear a little more clearly.